For Gaming benchmarks, We chose to consolidate to key newer titles and consolidate them on to targeted pages for easier navigation and less work for you to find what you need. Below are all gaming showing how these parts stack up. Please keep in mind that all systems are running a stock Nvidia GeForce GTX 1080 Ti. Shadow of the Tomb Raider just launched and I must say, the game is beautiful. 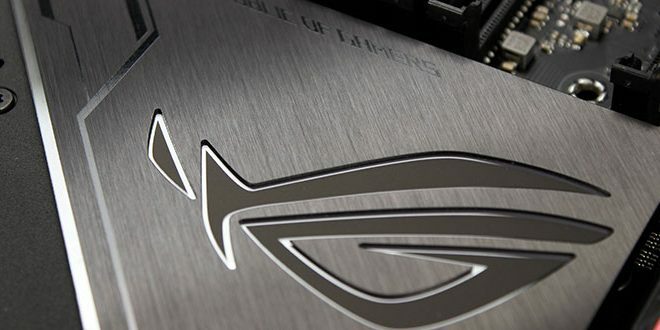 It should be a worthy stress test and a validation point for newer GPUs. It is also worth mentioning if you didn’t catch it on the list, but it will be employing some of the new RTX card features soon which means it will look even better! 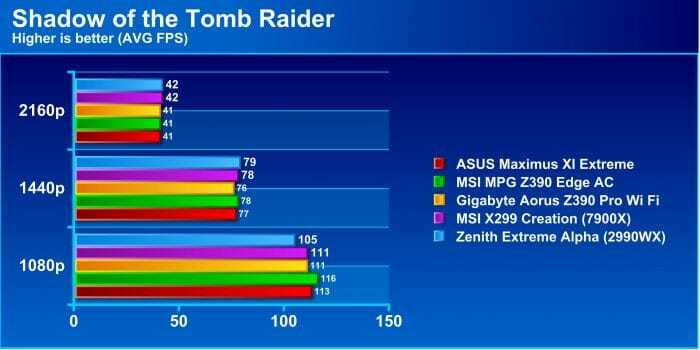 Here with Shadow of the Tomb Raider we see that 4K and 1440p are where the Zenith Extreme Alpha and 2990WX come into an advantageous position albeit not a huge one. At 1080p it is common for the GPU to not be a bottleneck and so FPS is more impacted by CPU performance, but let’s be fair here, who will but a massive HEDT platform and game at 1080p? Even after saying that, we have to look at the numbers and the Zenith Extreme Alpha with the 2990WX falls a little behind by about 3-4% at 1080p which is not horrible but you will bottleneck your gaming slightly at low settings in a new title like you see here. Far Cry 5 we see some surprising results as I know its leverages CPU horsepower but I had no idea it was to this level. Far Cry 5 shows results on par with the biggest and best or within a percent of performance. Of course, as expected that gap widens at 1080p again but if you are building and using a system of this level you are likely running a higher resolution and this test above shows you can definitely game and get relatively similar performance. 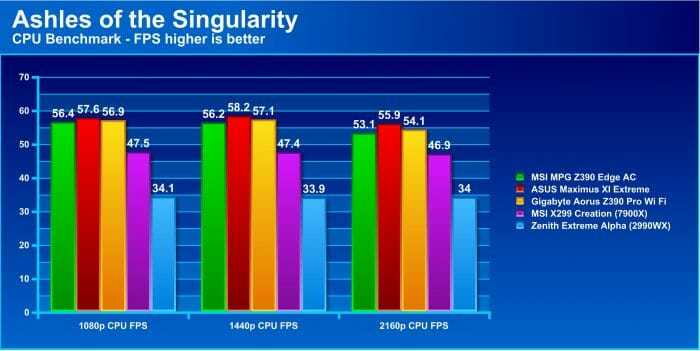 Ashes of the singularity technically should be in the synthetic benchmark page at this point as I think it has become the running joke in the reviewer circles as being basically the only game that nobody ever plays but is always benchmarked. Here we see that the CPU benchmark shows the 2990WX falling behind a bit as it simply did not want to scale the cores and instead opted to prefer the lower core count but higher speed chips. 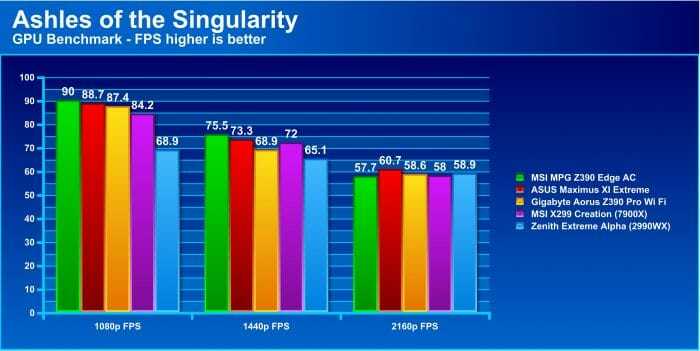 The GPU performance once again is similar but keep in mind that CPU based games may suffer should you choose Threeadripper as a gaming platform. Civilization VI is a great game turn based and it can be very long and methodical. This may raise the question of how this is a proper benchmark, but as it has an AI benchmark which measures your systems speed at processing turns in the game it suddenly becomes clear why we chose it. here you can see that the Threadripper 2990WX is a powerhouse of a CPU and based on its scale of performance you can almost half turn times on the AI performance. Obviously, I would NEVER recommend buying a Threadripper just to play CIV, but its a good representation of relative performance capabilities should a game engine support scaling the threads. Now you see for teh most part what the Zenith Extreme Alpha enables when fitted to a 2nd Gen Ryzen Threadripper. Lets see what we can do with turning up the speed a bit via overclocking.